THUNDER BAY, Ont. 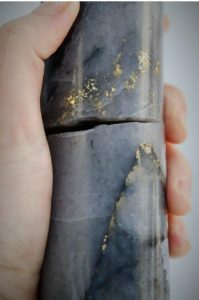 – The exploration team of Great Bear Resources has won the Bernie Schnieders Discovery of the Year Award for finding high grade gold zones at its Dixie property near Red Lake, Ont. The company recently drilled its Dixie Hinge zone, intersecting 30.15 g/t gold over 7.3 metres, 130.49 g/t over 1.5 metres, 11.72 g/t over 4.0 metres and 50.72 g/t over 0.5 metre in a single hole. Great Bear president and CEO Chris Taylor thanked the NWOPA for the honor, as well as support from the mining industry, and partial funding from the Ontario Prospector Association’s junior exploration assistance program. Read the latest corporate presentation at www.GreatBearResources.com to learn how the Dixie discoveries were made.